This is one of four reports from the Beyond Abuse project. This document is the overview of the project, including information about data collection, who used the service, challenges the project faced, learnings and recommendations. Lack of current provision for LGBT people in domestic abuse services and services that are not LGBT affirmative means that LGBT people are marginalised. There is an overall need for more inclusive specialist support that is competent to address significant complexities and intersectional oppression (racism, sexism, ableism etc.) experienced by LGBT people. LGBT people may experience any range of institutional, structural and interpersonal abuses throughout their lives. These experiences impact on how LGBT people understand and respond to domestic abuse. Anecdotal evidence suggests many survivors have difficulty finding culturally competent and non-traumatizing supports due to overall stigma, lack of economic resources, or the absence available community outreach programs. If service providers do not understand the needs and priorities of LGBT survivors and intersecting oppressions that exist, their work may cause more harm than good. 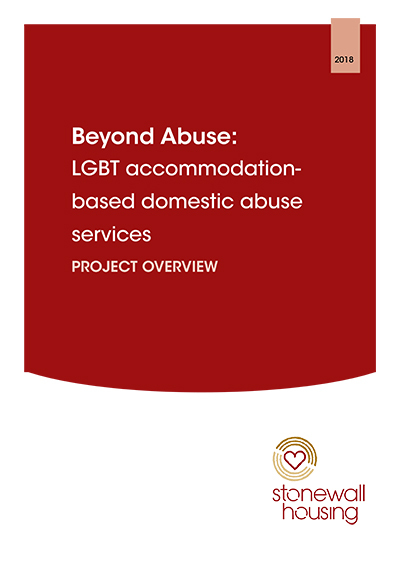 Undoubtedly this innovative multi agency project even in its incomplete form (lack of accommodation in London) demonstrates that the project impacted positively on the lives of LGBT survivors of domestic abuse. WEMWBS scores in all three projects have shown marked improvements for survivors as a result of LGBT specific services.